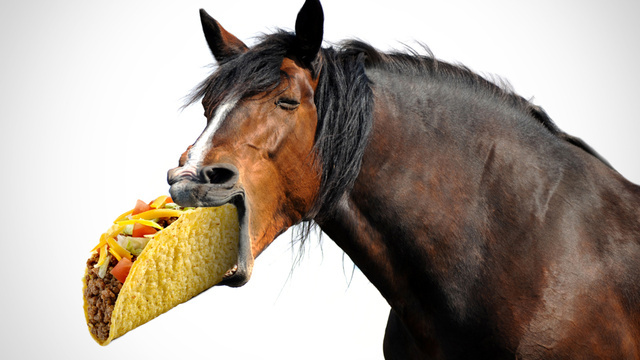 Taco Bell moved to pull beef off its UK menus this past Friday because of traces of horse meat found in the product. A spokesperson for the company commented: “We apologize to our customers and take this matter very seriously as food quality is our highest priority.” The problem with this statement is that it calls into question just what Taco Bell considers to be “food quality.” Obviously phenylbutazone isn’t something Taco Bell wants in its products. This is a company that is trying to brand itself as something more than fast food, from the “Think Outside the Box” campaign, to the recent artesian kitchen look with chef Lorena Garcia and her supposed quest for the “highest quality ingredients.” Not convinced? You can go to the Taco Bell website and learn more (or in keeping with the company slogan, Learn Más!). Here, at last, you can rest easy knowing that Taco Bell uses 88% premium ground beef, and 12% signature recipe. What? 12% of its product is. . . a recipe? The assurance I should get by hearing this supposed break down of ingredients is undermined when I haven’t a clue what that means. The ad tells me to go to the website learn what the recipe is, but it’s buried. Hunt it down though, and it comes out to water and a bunch of seasoning. So no worries there, I guess. How about this premium beef? The beef is not described on the ingredient statement, though bacon is. I am again assured that Taco Bell uses the same beef I buy at the supermarket. Taco Bell (or rather Yum! Brands, the parent company, which also owns KFC and Pizza Hut) claims to be one of the largest beef purchasers in the country, which allows it to buy in bulk and pass the savings on to me. Huzzah savings! I’ll be getting me some cheap tacos (and cheap chicken and cheap pizza too, one can only assume). One problem: that still doesn’t tell me a darn thing about what I’m eating, or where it’s coming from. Trying to learn what happened to this product on its way from animal to tray is a futile task for casual internet searches, since it’s part of the company secret, and protected under the law, lest one were to take terroristic action to disrupt the food chain. The other benefit is that the consumer does not get to know anything about what she’s putting in her mouth. This becomes a problem, as illustrated last week when Yum was in the news over contaminated chickens in China. Sales plummeted in China when it was learned that antibiotics were being pumped into the chickens “beyond food safety limits.” Oh, say it ain’t so! How much antibiotic is that, exactly? Well, that is too much information for the consumer. All you need to know is that there was too much, and now there is just enough, so stop looking behind the curtain and asking so many questions. The point is that media coverage on the “horse meat outbreak” is laughable. While I don’t want to discourage watchdog reporting on our food infrastructure, it’s absurd that people are this concerned over potential ingestion of phenylbutazone when the same people are happily indulging in chicken that has antibiotics in a “safe” amount, without knowing what that limit or definition is, and eating beef that can’t be easily traced to its source. My friends, this is industrial farming; its very nature renders it inherently prone to contamination and hazards. The only way to be safe is to avoid it entirely. Even more reason to order the bean burrito.